The Detroit-Superior Bridge is both a beautiful and historically significant remnant of Industrial Architecture that provides many unique and innovative design opportunities to restore the structure, rejuvenate its spaces, and unite the surrounding communities. The existing architecture and materiality of the lower level are powerful historical remnants of this great bridge and provide insight into the industrial era. 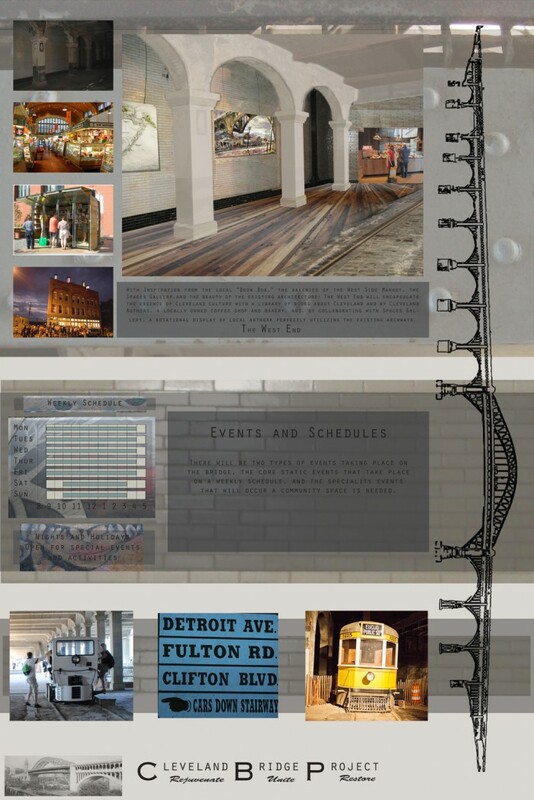 The restoration and preservation of such elements as the trolley tracks in the floors, the intricate tile work of the walls, the trolley cars, signs, and other artifacts, and the great columns throughout the entire space offer a glimpse of the past history of the bridge. With these elements at the core of the bridge redesign, the spaces lend themselves to new, centrally located, community space. 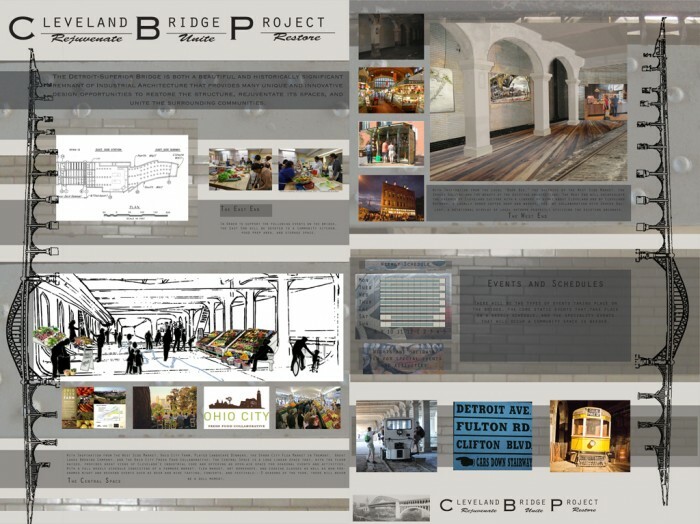 Located centrally in the heart of Cleveland, this bridge provides the perfect central node and connection point—a middle point that is not only a passage connecting the sides together, but a gathering place for locals and visitors alike. The Detroit-Superior Bridge is an iconic image of Cleveland’s industrial heritage that is an important element of Cleveland, Ohio. 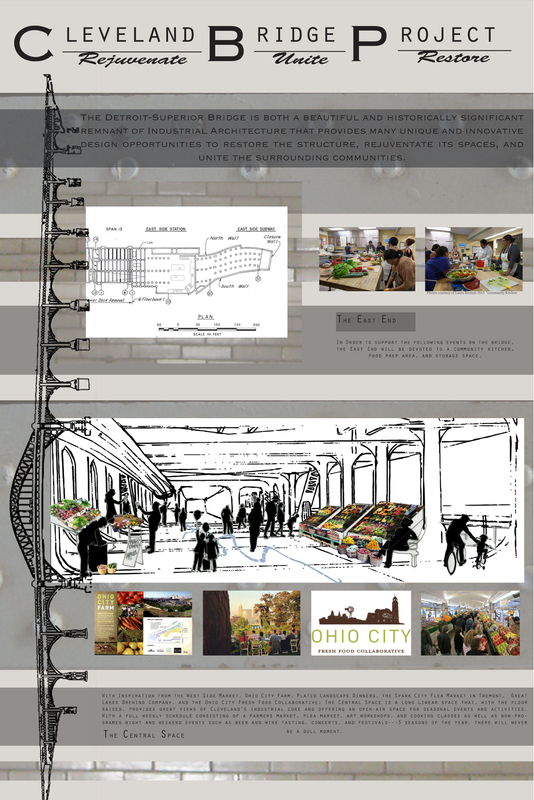 The design opportunities presented for the lower level of this bridge are endless and the redesign is will not only create a strong center to Cleveland, but it will also spark the regeneration of the river and the rest of the post-industrial landscape surrounding and involving the Cuyahoga River.